Todolwen: Being Creative On A Larger Scale .. I hope you all had a lovely weekend. I did, even though it was a little different than I had thought it would be. I suddenly decided it might be a good idea to finally paint our living after all, quickly and just in time for Christmas. Wrong timing .. maybe a little for sure but it had been on my to-do list for some time now and I wanted it done. I could already see it in my mind what it would look like once done and I couldn't wait any longer. I will have to look for more before photos in my files and then share them with you once the room is completely done. The next morning I was up early and decided to take a little slower pace so things might work out a little better that day and they did! 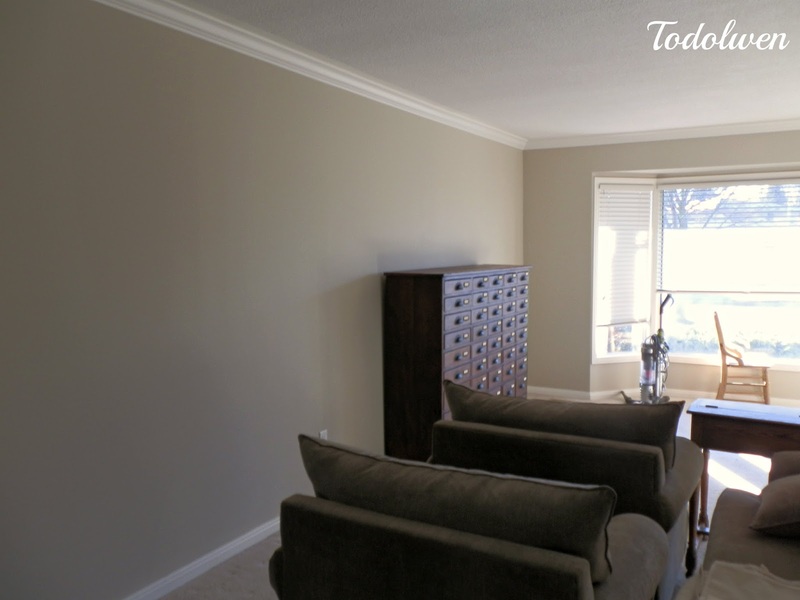 ... 'Grant Beige' from Benjamin Moore. 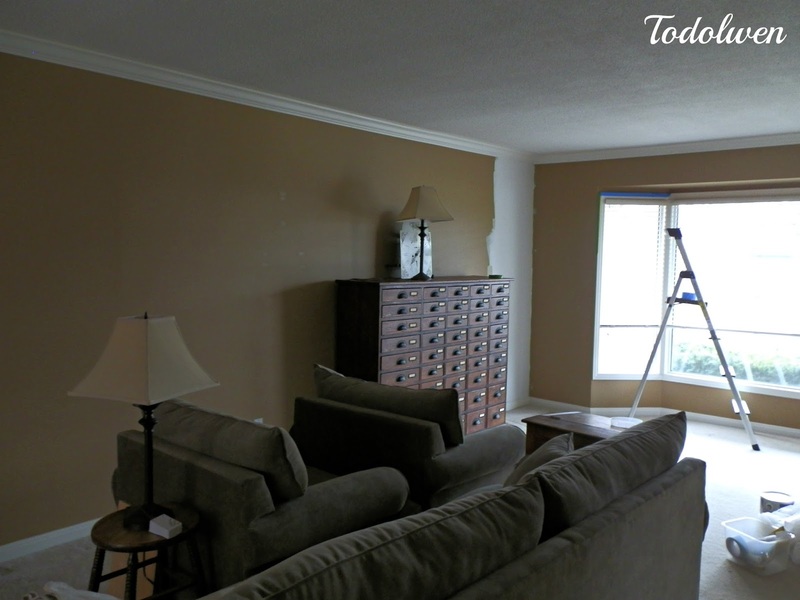 I moved the furniture, primed and painted all the walls in about 6 hours and I was so happy once it was done and that is all I could do for that day. My back was shouting at me to stop moving, so I did. I spent the rest of the evening with heating pillows comforting me poor back and sipping a lovely cup of tea .. almond and biscotti, it was so good! Sunday was spent doing a lot less. I slowly started to move some of the furniture back into their place and that is pretty much as far as I have gotten. I am still working on what is going to go on which wall when it comes to pictures and other wall decorations and I think I might need a new piece of furniture or two now to complete this room. I am just glad my husband doesn't really read my blog because he has no idea I am doing this. Let us say it is a little surprise for him when he comes home for Christmas, that is if he notices it this time. He didn't the first two times. 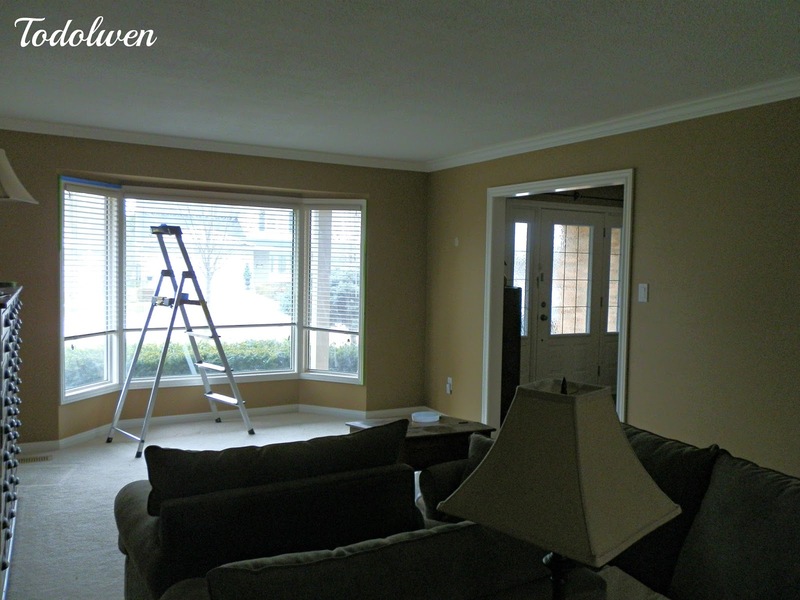 I had painted our master bedroom from dark yellow to this color and our family room from a sandstone color to this and he did not notice it right away! It took a day for him to realize the color had changed. Now I am already eyeing my kitchen and dinning room with the thoughts of painting it too before Christmas, it is such a dark barn red and the color just soaks up all the light, but I will have to wait and see. I will see what else I have to do before Christmas. I just can't seem to stop being creative, either in a large scale or on a smaller one but whatever I do, I will make sure to share it with all you lovely bloggers. Do visit me soon again here at Todolwen and see what I have been up too. Karen I love the new color you have chosen for the walls. It is so peaceful! Be careful not to rush things before Christmas as it will still all be there after and you might have a much happier back! LOVE the new color. But know what I love more? That piece of furniture with all the drawers. Gaaaaaaaaaa - I want it NOW. I must say I totally approve of the new color. Your husband sounds like mine...he HATES it when I say "notice anything different?" That sounds like a LOT of painting to do before Christmas, don't over do and be laid up for the holidays. Oh wow - I simply can't imagine tackling a big project like that just before Christmas! You are a strong woman! The new colour looks so pretty, so I know you're happy you did it. 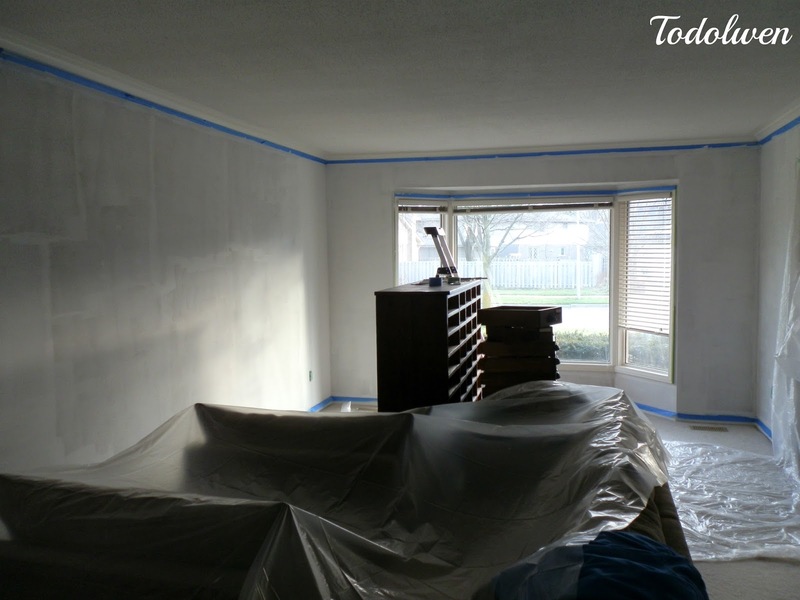 Come and paint my livingroom too, please ;-) !